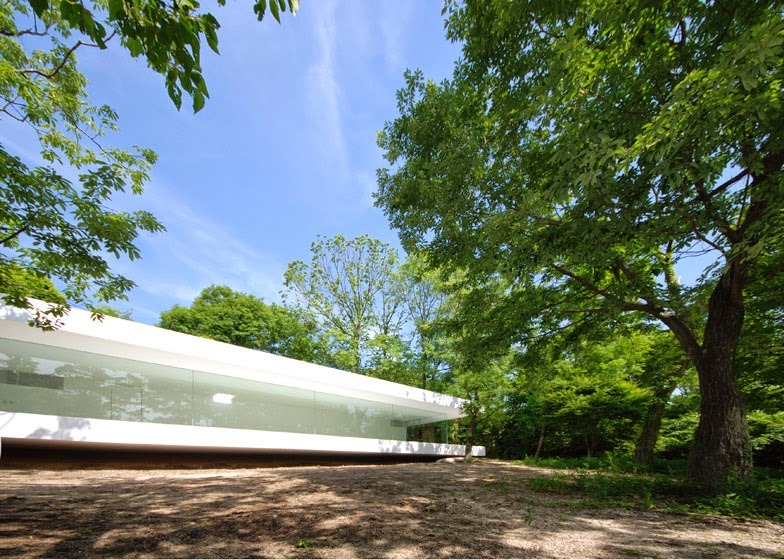 Japanese architects Shinichi Ogawa & Associates designed this minimalist house and gallery for a florist with an elongated, frameless glazed wall that opens to the forest. 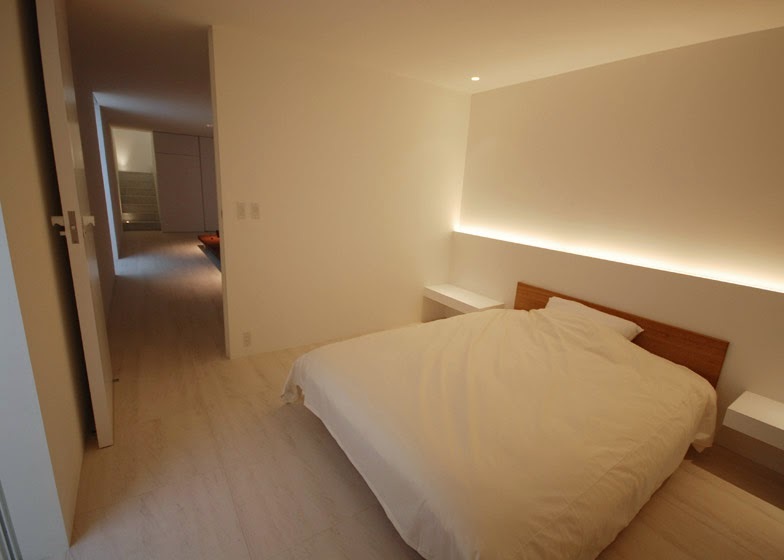 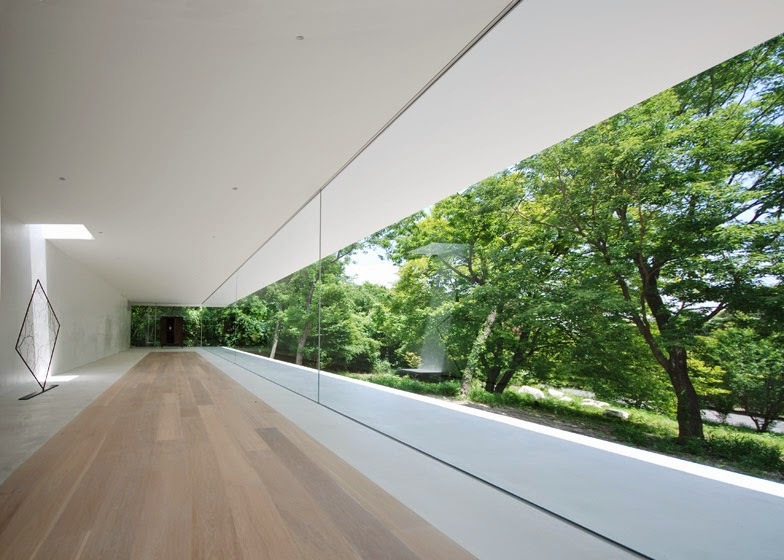 Located in Mie, Japan, the S Gallery and Residence is close to the Suzuka mountain range in a heavily forested region. 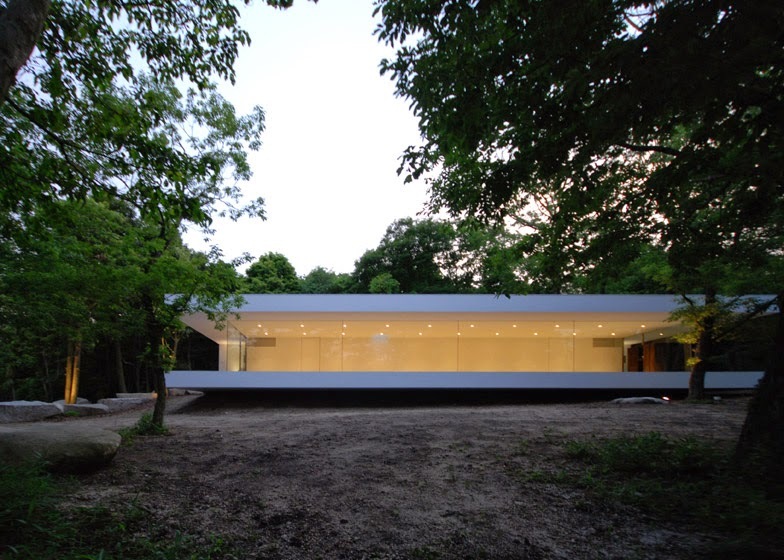 The building makes the most of its natural surroundings to complement its owner's work. 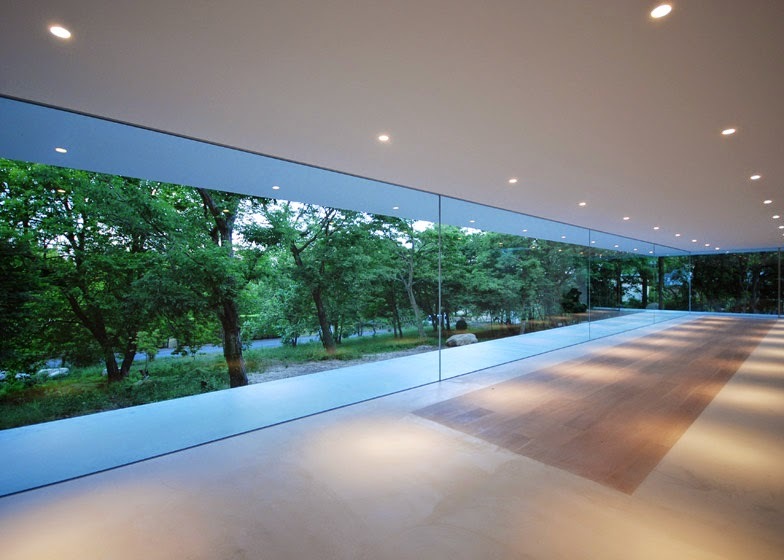 “The frameless glass makes this a special open space that is completely invaded by the exterior nature. 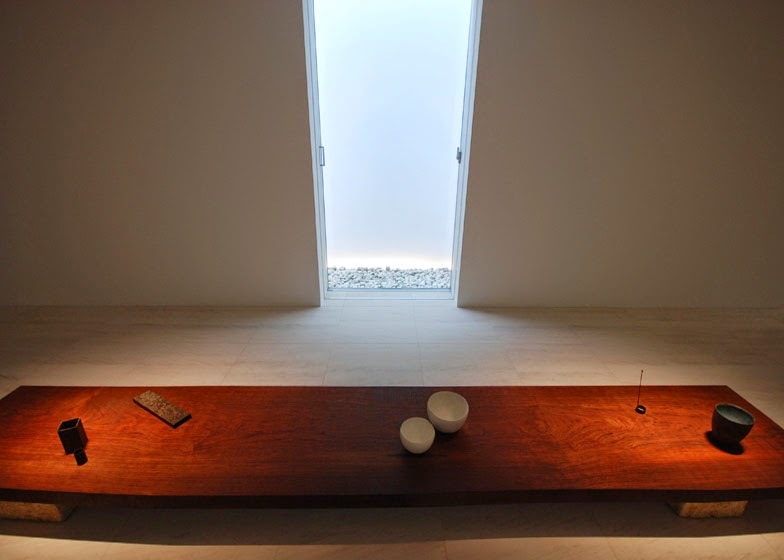 Thus, the gallery becomes a true stage for the client, while the exterior green landscape transforms into a perfect background setting." 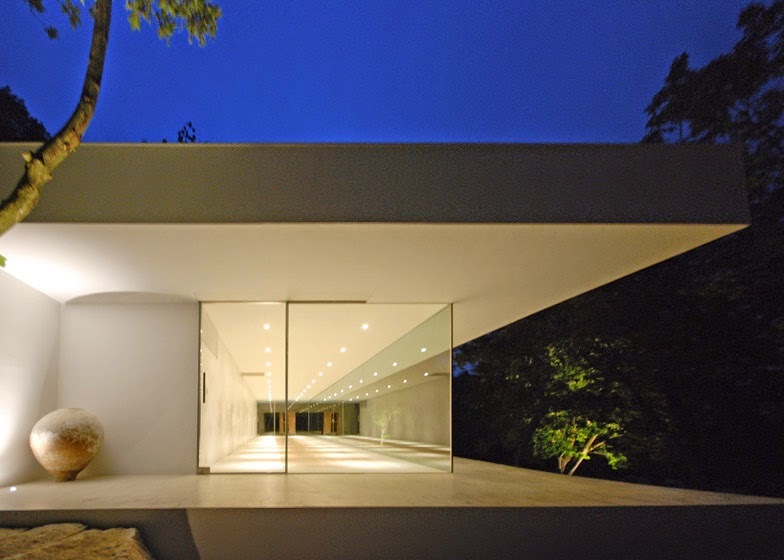 The glass is sandwiched between by a 22-metre-long floor slab and roof that project out at the front to form a sheltered terrace. 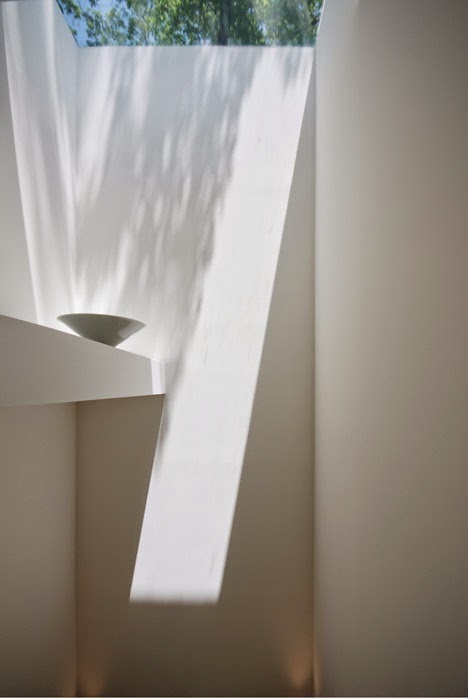 The reinforced concrete roof cantilevers from a steel framework, enclosing a corridor at the rear of the building, to ensure the gallery interior is free of any columns that might obstruct the view. 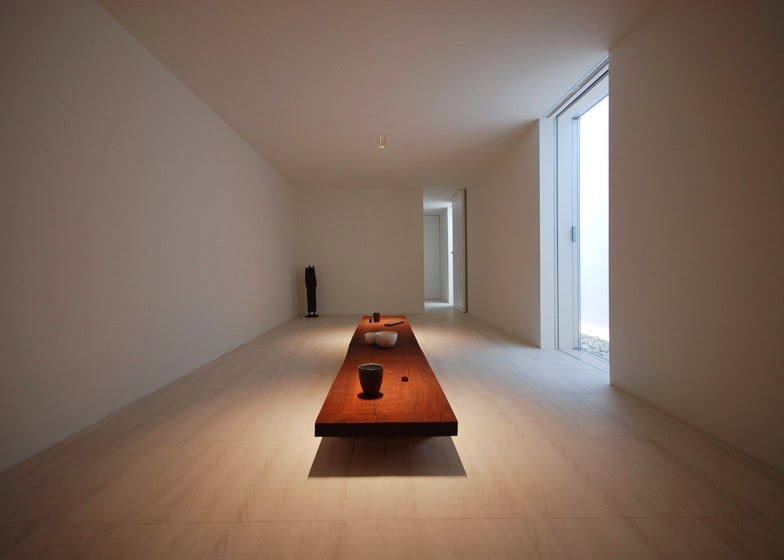 An identical lime mortar finish was used for the terrace and the main flooring inside the gallery to enhance the visual link between the indoor and outdoor spaces, while a wooden section embedded in the floor demarcates a dedicated display area. 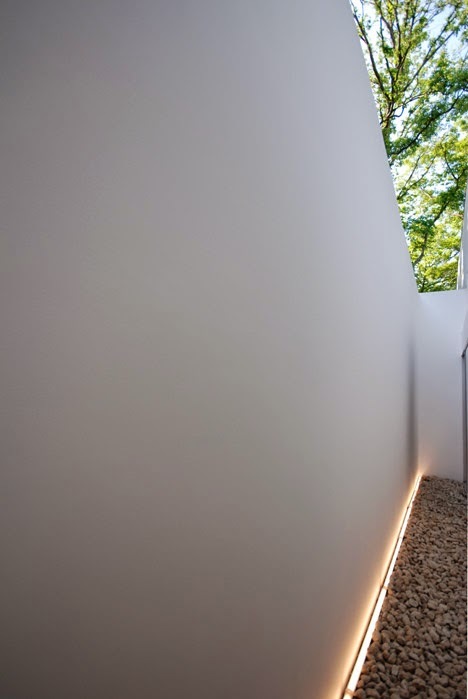 The horizontal planes of the floor plate and roof meet a wall at the rear of the building that gives it a C-shaped section when viewed from the nearby access road. 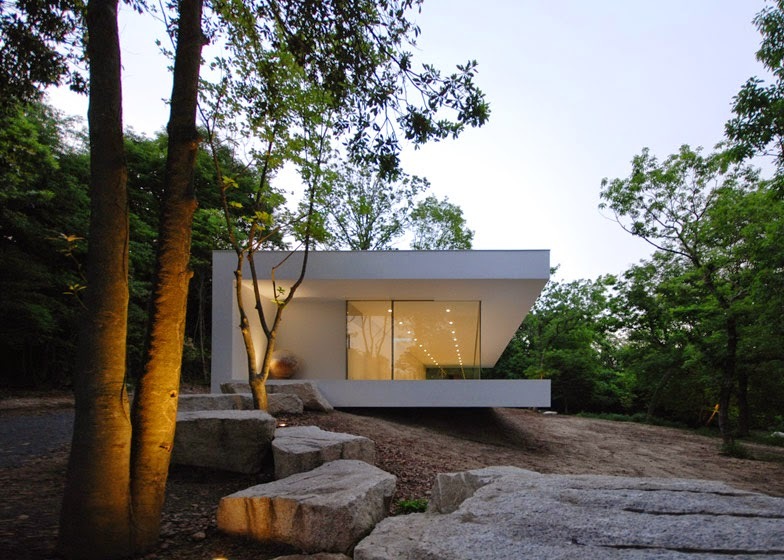 The building appears to balance on the edge of its sloping site but is, in fact, anchored by a basement level submerged in the hillside. 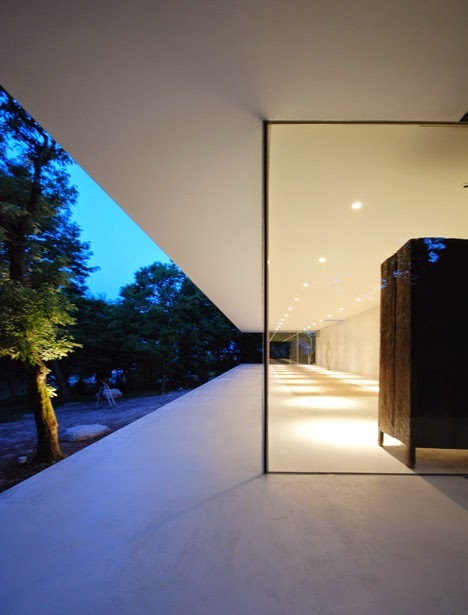 Seven enormous slabs of rock excavated during the construction process form a stairway that leads from the road to an entrance in the glazed end wall. 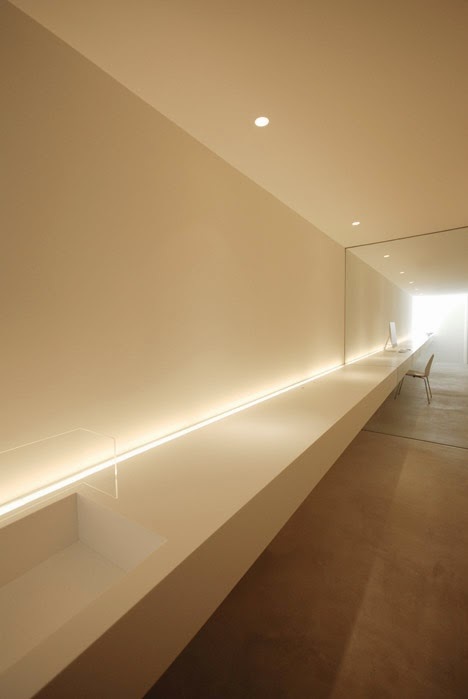 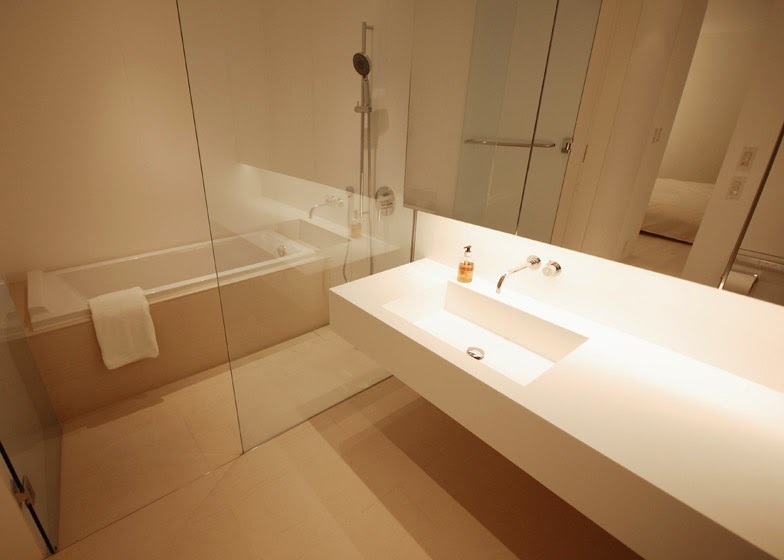 At the back of the building, a narrow corridor contains a cantilevered counter that runs along its full length and incorporates a washbasin for a WC concealed at one end. 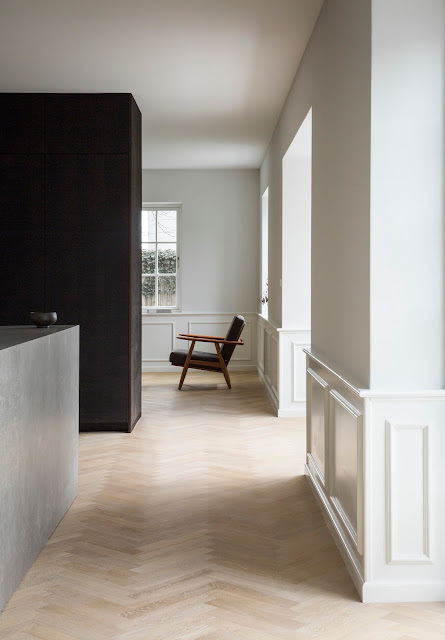 The counter can be used as a workspace, while glass shelves on the opposite wall provide space for the owner's collection of art and crafts. 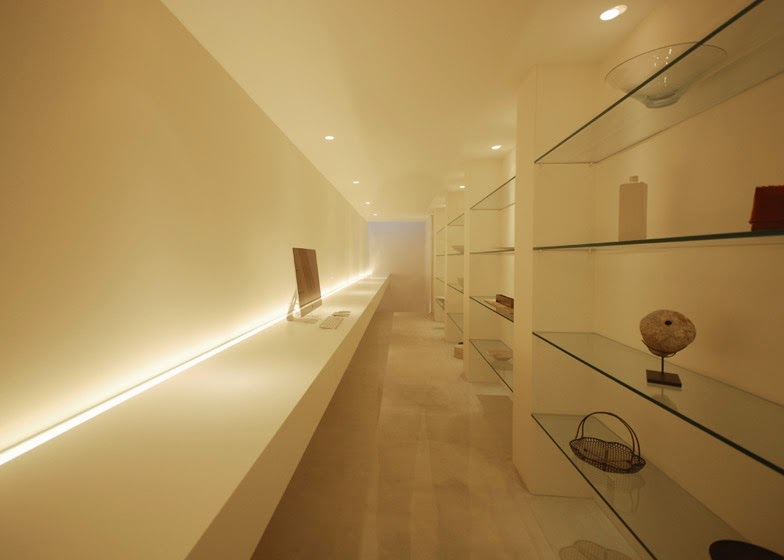 At the far end of the corridor, the counter projects over a staircase that descends to the basement level and is illuminated by a glazed opening in the ceiling. 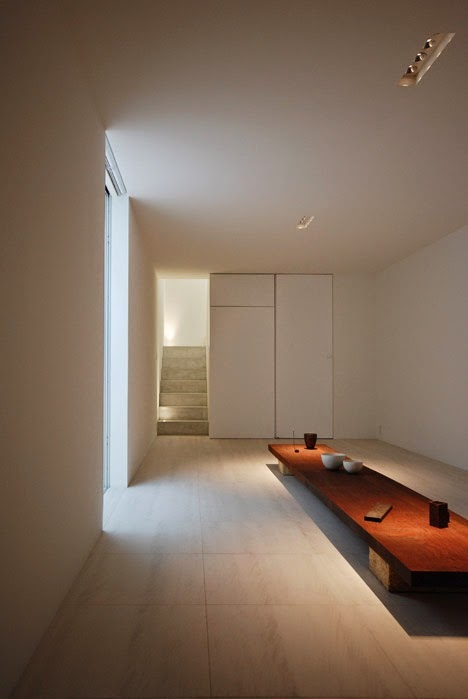 Below ground, a minimal living area with a low wooden table at its centre receives natural light from a narrow submerged courtyard located behind the rear wall. 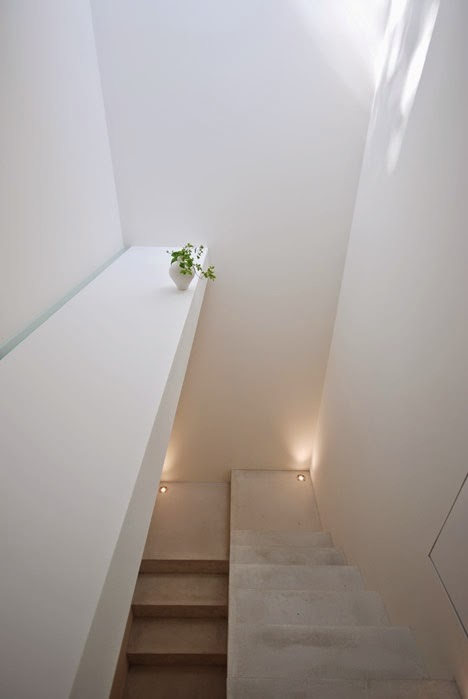 The kitchen is tucked into a space next to the stairs and a bedroom, bathroom and walk-in closet are accommodated at the opposite end of the subterranean space.